Toy Biz and Diamond Select present one of the Marvel Universe's most famous - and infamous - villains: Doctor Victor Von Doom! 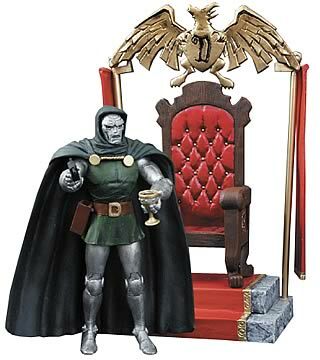 Standing 7-inches tall, Dr. Doom is scaled in proportion to the rest of the Marvel Select line. Sculpted by Sam Greenwell, this all-new release features 14 points of articulation and comes with a goblet with attached variant hand, pistol, and a detailed throne base with banners.